The Most Powerful Tool for Mentalism!!! 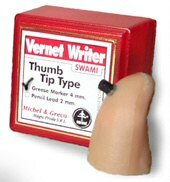 With Vernet Writers you can write letters numbers check marks etc. surreptitiously in front of the audience giving the impression it was written before the effect or event. It gives you lots of Possibilities. “VERNET WRITER BOON TYPE (Grease Marker – China Marker 4mm)”: The same but with this lead (Listo Pencil) the writing can be seen even in stage. -Can be used for close-up stand up or stage conditions.